Russia is a great naval power. The total length of its Maritime borders is 37636, 6км. the country is washed by 13 seas, 12 of which belong to three of the world's oceans: Pacific, Atlantic and Arctic. 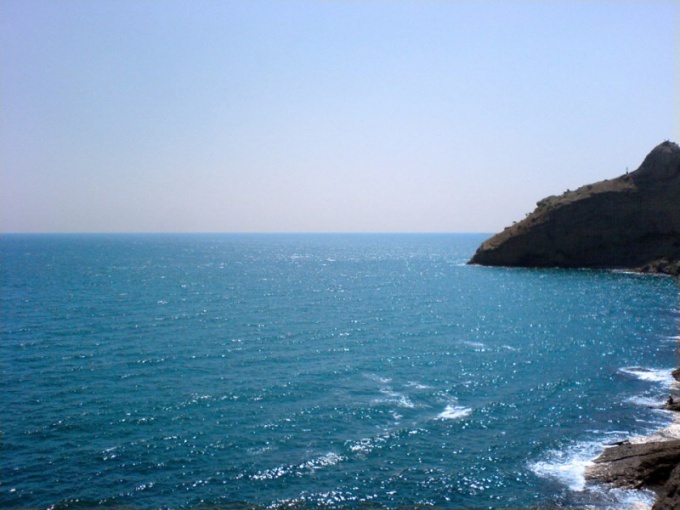 Thirteenth – the Caspian is a closed and not connecting with the ocean, strictly speaking, is a lake. Water six seas wash Russia in the North. They all belong to the waters of the Arctic ocean. Five seas - Kara, Laptev, East Siberian, Barents, Chukchi – polar, located between 70 and 80 North latitude and are continental - marginal. Their waters are limited to Islands or archipelagos of the Arctic ocean. Sixth - the White sea. It is located slightly to the South, crosses the Arctic circle. Total area 6 of the Northern seas is 4.5 million sq. km in the Laptev Sea, an exciting part of the Nansen basin, is the most deep. The maximum depth value 3385м, average – 533м. The greater part of the territories of the Arctic seas ice is present year-round. Separate arrays of drifting ice persisted throughout the summer. The exception is the Barents sea. In winter ice-free remains its Western part. In the summer the ice melts. From the East the territory of Russia is washed by the Pacific seas - the Bering, Okhotsk, Japanese. They are located South of the Arctic, vast and deep. Apart they are separated the Kamchatka Peninsula and Sakhalin island. From the East they are limited to the waters of the Kurile and Japanese Islands. The largest and the deep Bering sea. Its maximum depth 4151м, medium -1640м. Okhotsk is the most shallow of them. Its maximum depth 3521м, middle – 821. All the Eastern semi-enclosed sea. Water exchange occurs through the Straits between the Islands and archipelagos of the Pacific. Black, Baltic and Azov – sea of the Atlantic ocean. They are all internal and stretch out into the land. The black sea is the warmest of seas washing territory of Russia. According to the hypothesis expressed by Pliny the Elder, 7500 years ago the Black sea was a freshwater lake. The level was much lower than it is now. With the end of the glacial period, Global sea level has risen. The black sea basin and the adjacent extensive areas were flooded. The greatest depth of the Black sea 2210м, medium – 1240. A characteristic feature is the almost total absence of life at depths of 150-200m, due to the high degree of saturation of the lower layers of water with hydrogen sulfide. The Baltic and the West sea, washing the coast of Russia. From the Atlantic ocean that separates the Scandinavian Peninsula. Water exchange occurs through the Straits. Shallow, the maximum depth of 470m, the average is 51. A characteristic feature is the very low level of tides. The Azov sea is semi-enclosed, connected with the ocean is through the Strait of Kerch and the Black sea. The most shallow in the world. Maximum depth 13m, the average is 7. Caspian – thirteenth of the sea, washing the shores of Russia, the largest inland body of water on the planet. Not reported from the World's oceans, and, indeed, is a lake. However, the composition of the water and what animals live there, it can be attributed to the seas. About 50 million years ago, it was part of a huge reservoir, which includes also the Black and Mediterranean seas. The last 30 million years the connection with the World ocean was lost and restored repeatedly. At present the Caspian sea level is unstable, subject to periodic fluctuations, the cause of which is not established.